David S. served in the U.S. Navy for twelve years and has an Associate’s Degree in Information Technology. Despite his education and experience, David was having difficulty obtaining a full-time job. Having recently lost his job, he attended a WIOA Orientation in the SC Works Center in January of 2018, where he learned more about possible training scholarships. David decided a career change may help with his employment options and began to pursue education options in manufacturing. Shortly after attending the WIOA orientation, David enrolled in the WIOA program. Working together with a WIOA Career Coach and an SC Works Workforce Consultant, he attended Resume and Interviewing Workshops, and retook the WorkKeys assessment, scoring a Silver WorkKeys Certificate. David pursued training certificates in SCMC (South Carolina Manufacturing Certification) and CNC (Computer Numeric Controlled) Machine Operator. 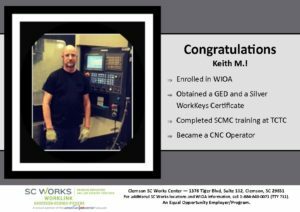 After attending an Open House at Tri-County Technical College, he was awarded a $2,000 Workforce Scholarship to cover the cost of his SCMC courses, and he received a WIOA scholarship which covered the cost of his CNC courses. He completed the SCMC course at Tri-County Technical College in May of 2018 and obtained 10 certificates, including Manufacturing Standards Skills Council (MSSC), OSHA, Six Sigma, and Snap-On Tools. At the end of his class, Tri-County Tech connected students with employers and conducted on-site interviews. David was able to interview for a position at E&I Engineering and quickly gained employment as an EHRT Machinist. He began work immediately after completing his certification classes, earning a great wage. David continues to attend the CNC course that began in April of 2018 at TCTC, while maintaining full-time employment. He really enjoys his new job and hopes to continue to advance in the company. Because David came through SCWorks WIOA, the SC Department of Employment and Workforce DVOP program, and an approved WIOA Training Provider, Tri-County Technical College, he can say, “I’m the next one!” Congratulations, David, on being the next one employed, the next one with SCMC Certification, the next one to continue you your education in CNC, with a WorkKeys Silver Certificate, and the next one to achieve your dreams! Nolbi S. enrolled in the SC Works WIOA program in May of 2017. Nolbi wanted to finish her GED, and needed assistance from the WIOA program in order to so. Nolbi was able to complete her GED and received her Silver WorkKeys Certificate in May of 2017 from the Anderson Adult Education Center. Working with her WIOA Career Coach, Nolbi knew getting her GED wasn’t the end of her educational pathway. She and her Career Coach discussed PCT (Patient Care Technician) training at Tri-County Technical College. Approved for a WIOA scholarship, she began attending PCT training in July of 2017 and finished in April of 2018. She was able to gain full-time employment, even before she finished her classes at TCTC, at NHC in February 2018 as a Certified Nursing Assistant. Nolbi will be taking her phlebotomy certification on July 11th, and upon passing the exams, will hold a certificate in Phlebotomy, Certified Nursing Assistant, and Electrocardiogram Technician. Because Nolbi came through SCWorks WIOA, the Anderson Adult Education Center, and an approved WIOA Training Provider, Tri-County Technical College, she can say, “I’m the next one!” Congratulations, Nolbi, on being the next one employed, the next one with a CNA Certification, an Electrocardiogram Technician Certification, Phlebotomy Certification, a GED, and a WorkKeys Silver Certificate, and the next one to achieve your dreams! Jeremy E. and his pregnant wife moved to South Carolina from Alaska in late April to be closer to family. With his first son only two weeks from his due date, Jeremy needed options. They were staying with family until they could get their feet on the ground. Jeremy decided that the only way to provide for his family was to gain his CDL Class A truck driving license. Soon after Jeremy enrolled in the WIOA, his son was born. Jeremy had to make a choice only one week in to his training. Jeremy dropped down to a CDL Class B license in order to get into the workforce faster. With the help of his instructors and WIOA Career Coach, Jeremy has been able to find employment with N.W. White as a Dump Truck Driver and will be able to provide for his wife and their new son, with a salary that’s above the expected starting pay for drivers in South Carolina! Jeremy said that he is very thankful for his WIOA career coach and his TCTC instructors that were always there to help him through this whole process. Because Jeremy came through SCWorks and an approved WIOA Training Provider, Tri-County Technical College, he can say, “I’m the next one!” Congratulations, Jeremy, on being the next one employed, the next one with a CDL Class B, and the next one to achieve your dreams! William “Jasper” B. worked for twenty years as an Exhibit Designer for tradeshow clients. Skilled in planning, coordinating, and creating display exhibits for customers’ use in industry trade shows, Jasper was laid off by his employer in May of 2017. At first, he looked around for work similar to his experience, but had a difficult time finding it and became concerned that the industry wasn’t as stable as before. Deciding a career change was necessary for success, he began pursuing training options CDL (Class A) program at Tri-County Technical College. He felt this could lead to a good paying job in a stable industry. During the process of gathering details about the CDL program, he found out about the WIOA Program. Interested, he contacted SC Works, found out he was eligible, and enrolled into the WIOA program in October of 2017. He was then approved for a training scholarship and began classes in February of 2018. Jasper’s training was complete in March of 2018. That same month he began working as a Driver for D & S Trucking, earning a great wage with full-time hours. Jasper has expressed his appreciation to his WIOA Career Coach for everything SC Works has done for him. Because Jasper came through SCWorks and an approved WIOA Training Provider, Tri-County Technical College, he can say, “I’m the next one!” Congratulations, Jasper, on being the next one employed, the next one with a CDL Class A, and the next one to achieve your dreams! 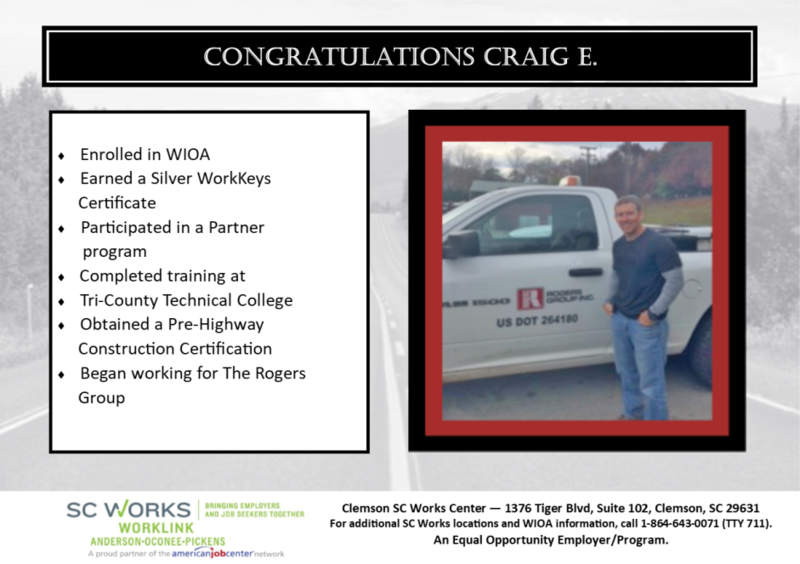 Craig E. entered the WIOA program in July 2017. It is through the partnership WIOA has with The Haven of Rest that has allowed Craig to achieve all of his goals. Craig was able to complete WorkKeys and scored a Gold in reading, Silver in locating information, and Gold in applied math. Craig was interested in the pre-highway construction field and was awarded scholarship assistance from Tri-County Technical College and WIOA to complete the pre-highway training. Craig started training on 10/16/17 and completed it on 11/9/17. Craig started working at Total Fitness in November, but still had aspirations to work in the pre-highway field. On 2/2/18, Craig was given the opportunity to work full time with The Rogers Group as a quality control/roadway/lab technician. 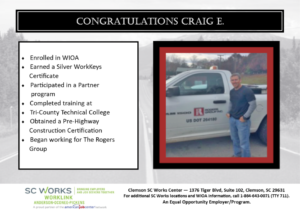 Through the partnership of WIOA, TCTC and The Haven of Rest, Craig has been able to complete his goal and obtain employment in the pre-highway construction field. This is an in-demand field in Anderson and surrounding counties, and Craig is now self-sufficient. Because Craig came through SCWorks and an approved WIOA Training Provider, Tri-County Technical College, he can say, “I’m the next one!” Congratulations, Craig, on being the next one employed, the next one with a Pre-Highway certification, a WorkKeys Silver Certificate, and the next one to achieve your dreams! 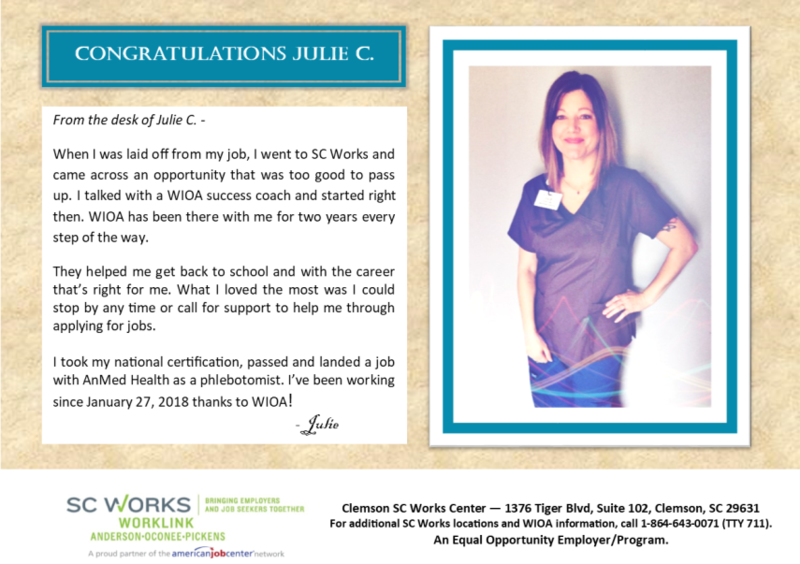 From the desk of Julie C.
“When I was laid off from my job, I went to SC Works and came across an opportunity that was too good to pass up. I talked with a WOIA success coach and started right then. WIOA has been there with me for two years every step of the way. They helped me get back to school and with the career that’s right for me. What I loved the most was I could stop by any time or call for support to help me through applying for jobs. Because Julie came through SCWorks and an approved WIOA Training Provider, Tri-County Technical College, she can say, “I’m the next one!” Congratulations, Julie, on being the next one employed, the next one with a Patient Care Technician Certification, and the next one to achieve your dreams! Stephanie M. first heard of WIOA (Workforce Innovation Opportunity Act) when she walked into an SC Works office and was informed of possible training services. She attended an SC Works Orientation and learned more about training opportunities. She says she was impressed by all of the programs that were offered and wanted to upgrade her skill set. Stephanie had over 10 years of experience in manufacturing, but wanted to gain new skills and work directly for a manufacturing company. Her goal was to obtain full-time sustainable employment, but she wasn’t exactly sure how to get there or what direction to go. After meeting with a Career Coach to enroll in the WIOA program, Stephanie attended a Resume workshop and Interview workshop with a Workforce Consultant. She states this was very helpful in contributing to her success in finding employment. She met with her Career Coach and took a couple of different career interest inventories before finally settling on a goal of obtaining CNC Operator Certification training. She decided to take classes at Tri-County Technical College to obtain these skills, as her goal was to obtain employment as a machinist at Borg Warner. She began CNC classes at TCTC on 12/5/2017 and attended 3 nights a week while working a full-time job. During the class, she became adept at CNC lathe operations, CNC mill overview, and measurement and gauging tools. She obtained a certification as a CNC Operator, in addition to certificates in NIMS (National Institute of Metalworking Skills) and OSHA (Occupational Safety and Health Administration). Shortly after completing her class, she obtained full-time employment at Borg Warner as a CNC Machinist, earning a great wage to start, and has already received a raise! 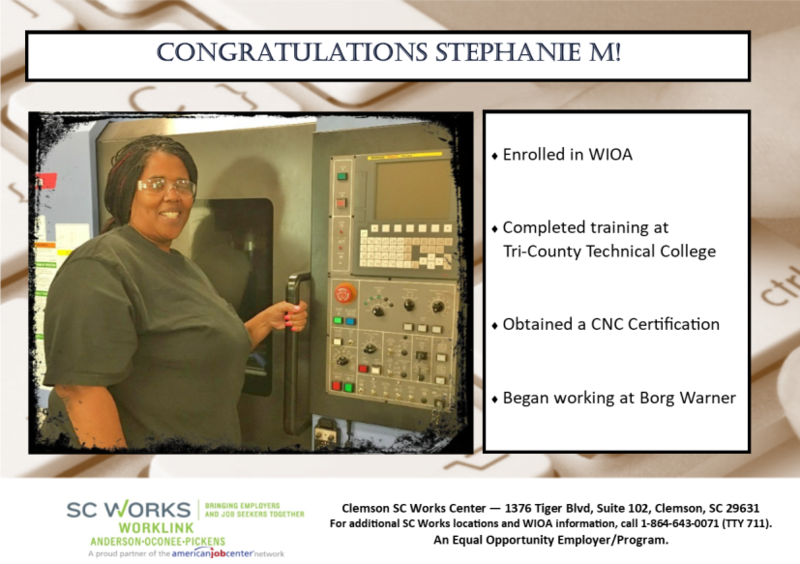 Because Stephanie came through SC Works and an approved WIOA Training Provider, Tri-County Technical College, she can say, “I’m the next one!” Congratulations, Stephanie, on being the next one employed, the next one with a CNC Certification, and the next one to achieve your dreams! William H. had been working for seven months as a laborer in the construction business. His duties included some equipment operation and other various tasks assigned by supervision. He also had four months experience in customer service where his duties included bussing tables, and retail sales. Although he was gathering valuable work experience, his wages were not at a level where he could sustain himself. He decided to pursue training in the Welding Program at Norris Mechanical. During the process of gathering details about the welding program, he found out about the WIOA Program. Interested, He contacted SC Works, found out he was eligible for the WIOA, and enrolled into the WIOA in June of 2016. He was approved for training funding shortly thereafter and began training that same month. William’s training was complete in November 2016. By August of 2017 he was working as a welder at Wofford Welding, and is currently working as a Welder at Davis Erecting, earning a self-sufficient wage and working 40 hours/week. William has expressed his appreciation to his WIOA Career Coach for everything SC Works has done for him. 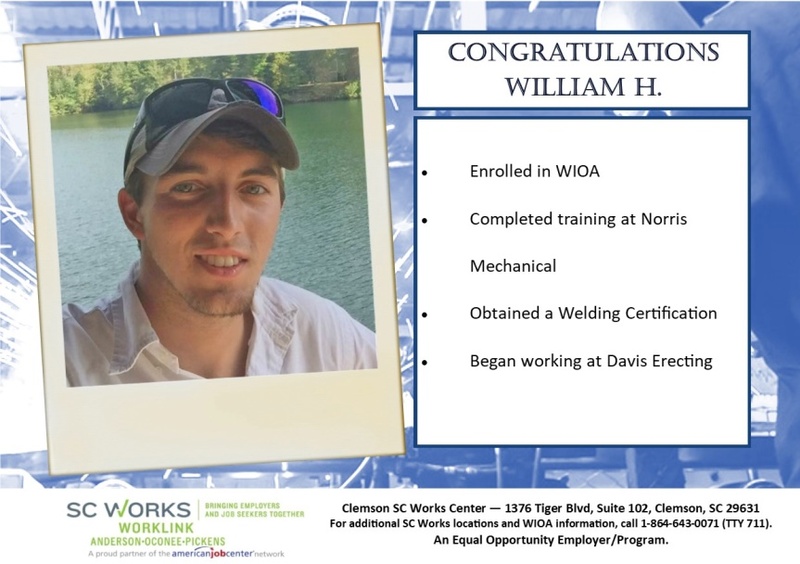 Because William came through SC Works and an approved WIOA Training Provider, Norris Mechanical, he can say, “I’m the next one!” Congratulations, William, on being the next one employed, the next one with a Welding Certification, and the next one to achieve your dreams! Jerold G. entered the WIOA program in November 2016. It is through the partnership WIOA has with The Haven of Rest that has allowed Jerold to achieve all of his goals. Jerold was able to complete Work keys and scored Platinum in reading and Gold in locating information and applied math. 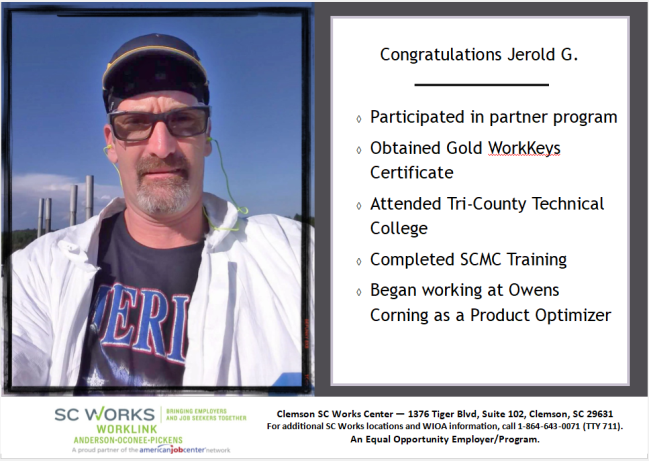 Jerold was interested in the manufacturing field and was awarded scholarship assistance for TCTC to complete the SCMC training. Jerold started the first of January and completed the training on March 22, 2017. Jerold started working with Owens Corning as a product optimizer on May 30th. Through the partnership of WIOA, TCTC and The Haven of Rest, Jerold has been able to complete his goal and obtain employment in the manufacturing field. This is an in-demand field in Anderson County and Jerold is now self-sufficient. 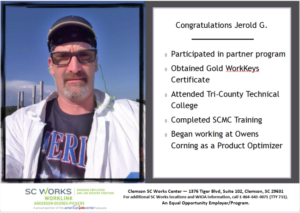 Because Jerold came through SCWorks and an approved WIOA Training Provider, Tri-County Technical College, he can say, “I’m the next one!” Congratulations on being the next one employed, the next one with a SCMC Certification and a WorkKeys Gold Certificate, and the next one to achieve your dreams! 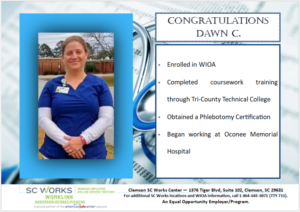 Dawn C.’s journey began with WIOA (Workforce Innovation Opportunity Act) in 2015, when she enrolled in the Patient Care Technician courses at Tri-County Technical College. She completed her CNA course, but could not continue with classes due to illness. However, she returned in the summer of 2017 seeking possible assistance and was able to find success. She attended a WIOA orientation in late June 2017 and soon after completed the WIOA application with her Career Coach. She had already obtained WorkKeys previously, and she attended Resume and Interviewing Workshops, which were conducted by a Workforce Consultant. After some career planning, she decided that her heart was set on becoming a Phlebotomist. She pursued Phlebotomy Certification training at TCTC. Her training was approved and she began classes in August 2017. Dawn received a scholarship through Tri-County Technical College, which covered the tuition for her classes. Funding from WIOA covered the cost of her pre-requisite courses, books, uniforms, immunizations, background check, and drug screen. Dawn excelled in her classes and was given glowing recommendations from her instructor. Her clinical was completed at Greenville Health System, where she was hired on as a Phlebotomist within several weeks. Her goal was to complete and exceed the minimum number of “sticks,” which she not only completed but doubled in a short amount of time. She is now gainfully employed at Oconee Memorial Hospital and is still keeping record of her number of sticks. She began working on November 27, 2017 and earns a sustainable wage. She is also currently receiving training in Electrocardiogram Certification through her employer. 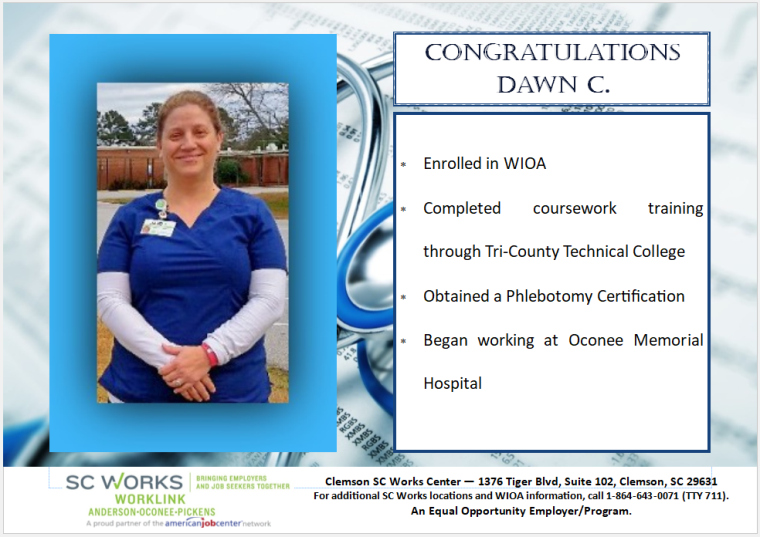 Because Dawn came through SCWorks and an approved WIOA Training Provider, Tri-County Technical College, she can say, “I’m the next one!” Congratulations on being the next one employed, the next one with a Phlebotomy Certification, and the next one to achieve your dreams! 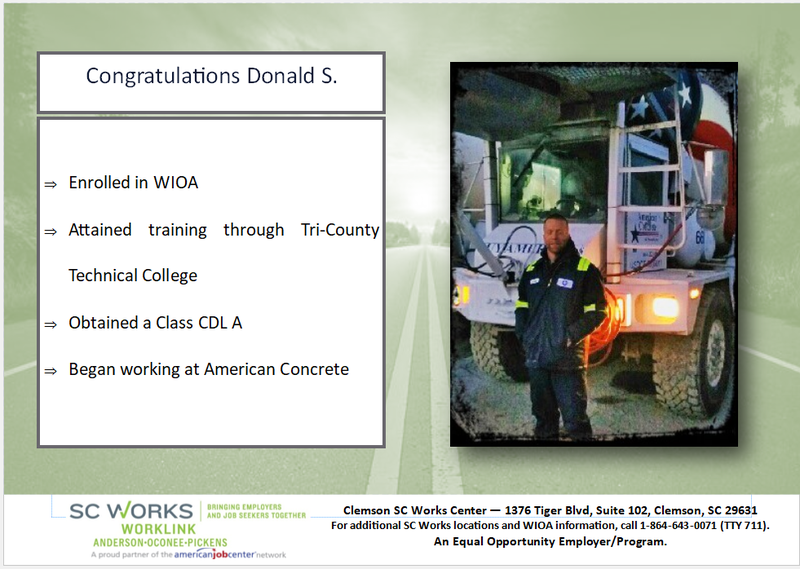 Donald S. came to the WIOA program looking to make a fresh start since being released from a Correctional Facility. He came back to South Carolina in 2015 and had been working as a carpenter for a local business. Donald realized that he needed to make more money, get benefits, have a stable career path, and that is why he chose Class A CDL training. Donald was enrolled in the WIOA in September of 2016 and began preparing to make his career change. Once his training was approved on November 26, 2016, he wasted little time in obtaining the required items necessary to gain entry into the Class A CDL training. He quickly obtained his DOT Physical and Class A CDL Permit. He was then enrolled in the next available training class that began on January 25, 2017. Donald enjoyed class and learning all about his new career. He learned how to keep his log book, complete a pre-trip inspection, how to double clutch when he changed gears, and even parallel park a truck and 54-foot long trailer. He completed the training and it was time for him to test for his license. Donald went to take the test, and unfortunately, he did not pass it the first time or the second time. He was down to his last chance, and if he failed it again he would have to take additional classes to continue. He was not discouraged. He went to the DMV in Greenwood for his third and final attempt, and he passed. After passing his test he took his time looking for a driving position. He knew he wanted to stay local so he could spend time with his family. On May 24, 2017 he began driving for American Concrete. He said it was “the perfect job. It pays well and I have benefits. I was able to get the job, money, and benefits I was looking for thanks to the training available through the WIOA.” Donald is making a great wage and says he will be getting a pay raise soon. 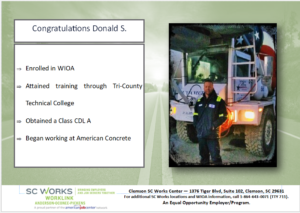 Because Donald came through SCWorks and an approved WIOA Training Provider, Tri-County Technical College, he can say, “I’m the next one!” Congratulations on being the next one employed, the next one with a Class A CDL, and the next one to achieve your dreams! Sherri G. worked for many years at the Pickens County Board of Disabilities and Special Needs. There, over the course of those years, she cared for many individuals with disabilities. She has always enjoyed working in the health field, but she did not have a certification in the field. She decided that she needed a certification so that she could have more options for finding sustainable employment in the health field. 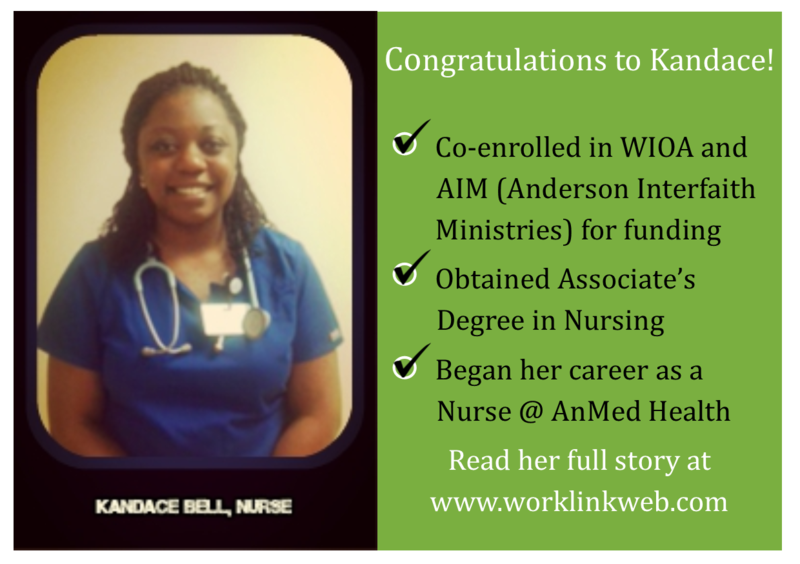 She decided to pursue training in the Medical Assistant Program at Greenville Technical College. During the process of gathering details about the Medical Assistant program, she found out about the WIOA Program. She then contacted SC Works, found out she was eligible for the WIOA, and enrolled into the WIOA in February of 2016. She was approved for training funding shortly thereafter and began training that June. By the time her training was complete, Sherri got a job as a Medical Office Assistant at New Horizons Family Health Center. She started there on November 27, 2017 making a sustainable wage, and is working 40 hours per week. Sherri was an excellent participant, and she will succeed wherever she goes. 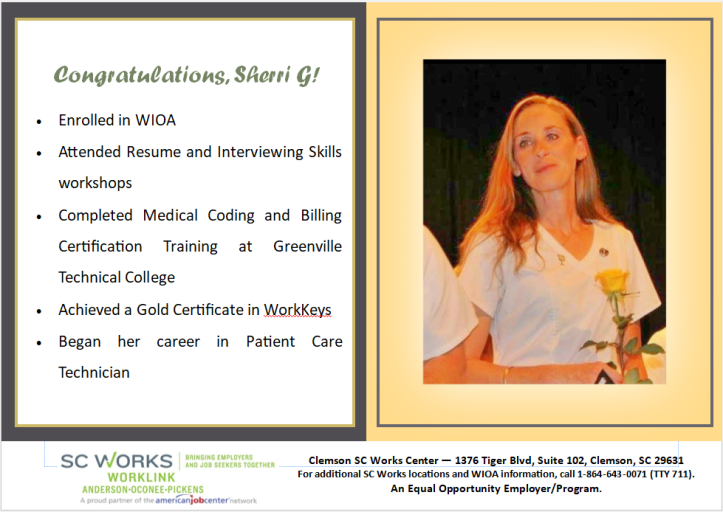 Because Sherri G. came through SCWorks and an approved WIOA Training Provider, Greenville Technical College, she can say, “I’m the next one!” Congratulations on being the next one employed, the next one with a CNC Certification, SCMC Certification, a GED, and a WorkKeys Silver Certificate, and the next one to achieve your dreams! Daniel has almost twenty years’ work experience that includes working in Accounts Collections, Project Management, and Project Coordination. His duties have included collecting debts from customers, creating collections policies, and customer service. After being laid off from his job, Daniel decided to pursue a career that would give him a more dependable, sustainable wage. 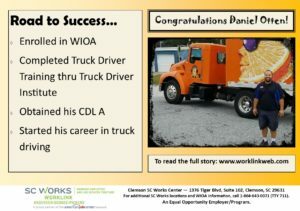 While at his local SC Works Center, Daniel learned about the WIOA program and how it could possibly help pay for training to get him back to work. He was enrolled into the WIOA program soon afterwards and decided to pursue the truck driver training program at the Truck Driver Institute. He completed his training on January of 2017, passed his examination, and got his Commercial Driver’s License. Daniel went to work with Budweiser of Anderson February of 2017 as a Driver. As can be seen in the above photograph, Daniel is very happy with his new employment. He states that he is very appreciative of what SC Works and the WIOA program have done to help him obtain long-term, sustainable employment. Because Daniel came through SCWorks and an approved WIOA Training Provider, Truck Driver Institute, he can say, “I’m the next one!” Congratulations, Daniel, on being the next one employed, the next one with a CDL, and the next one to achieve your dreams! Carlton is a recent participant of the WIOA program who has shown great motivation and determination. The story of his progress is one that needs to be shared and celebrated as a true success. Recently, Carlton sat down with his Career Coach to talk about his journey, and this is his story. Carlton’s story is why we do what we do. While he gives a lot of credit to the staff, it was his work ethic, motivation, determination, and character that allowed him to reach his goals. Since he started at Senn Freight on July 10th of this year, he has made it a point to stop by and let us know how SC Works has changed his life. He still has a hard time believing that he is making so much money while driving his truck over the road. We here at the Anderson SC Works are happy that we could help him along his journey! 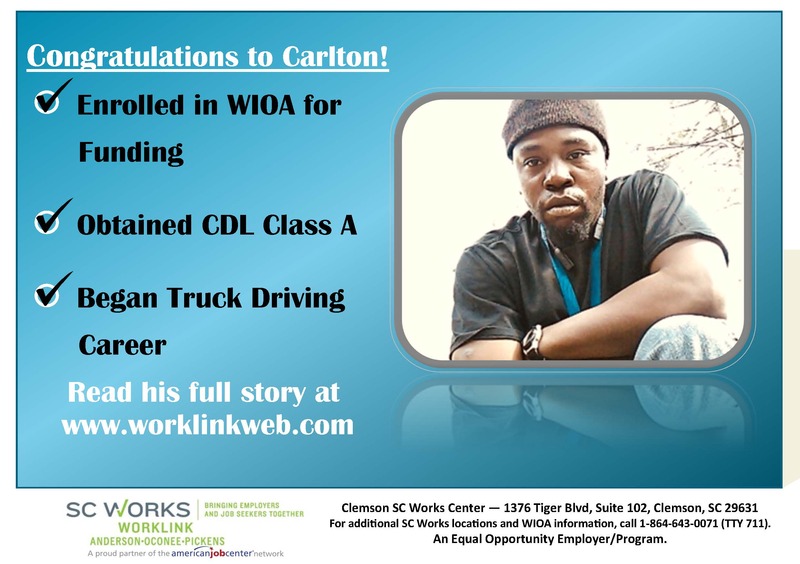 Because Carlton came through SC Works and an approved WIOA Training Provider, Tri-County Technical College, he can say, “I’m the next one!” Congratulations, Carlton, on being the next one employed, the next one with a CDL, and the next one to achieve your dreams! My name is Kandace B., and I was enrolled into the SC Works WorkLink WIOA program on July 24, 2015 for assistance with obtaining my Associates Degree in Nursing and gaining full-time employment. 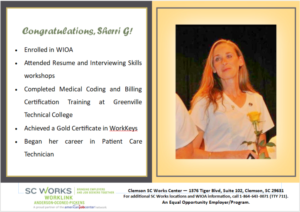 Through the partnership with AIM’s Women and Children Succeeding (WACS) program and the SC Works WorkLink WIOA program, I was able to graduate with my Associate’s Degree from Tri-County Technical College on December 13, 2016. WIOA was beneficial in helping me with the cost of obtaining this degree. The one-on-one service I received from my career coach was a blessing. I am so grateful for the help that was offered. While I -was in the WIOA program, I was able to obtain my Gold-level WorkKeys certificate. I started working at AnMed Health as a nurse on February 6, 2017. I would like to thank AIM and the SCWorks WorkLink WIOA program for helping me achieve my goal. Because Kandace came through SCWorks WorkLink WIOA, she can say, “I’m the next one!” Congratulations, Kandace, on being the next one employed, the next one with an associate’s degree, and the next one to achieve your dreams! 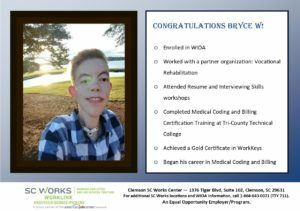 Bryce came to WIOA in June 2016 seeking possible training assistance. He holds an Associate’s degree in Criminal Justice, but has limitations on the ability to perform certain jobs such as being able to stand for long periods of time. 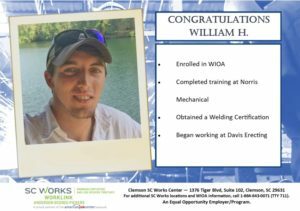 He enrolled in WIOA at the Seneca SC Works Center and attended Résumé and Interviewing workshops to assist him with future job opportunities. He researched career pathways and decided to pursue Medical Coding and Billing Certification training. He obtained a Gold WorkKeys scores and has the ability to type over 100 words per minute, making him an excellent fit for this field. WIOA was able to assist Bryce financially with the cost of tuition, textbooks, AAPC membership, and exam fees. Bryce worked hard in his classes at Tri-County Technical College and received above average grades. He now holds certificates in Medical Terminology, Advanced Medical Coding, Medical Insurance and Billing, ICD-10-CM, CPT, & HCPCS. Because Bryce came through SCWorks and an approved WIOA Training Provider, Tri-County Technical College, he can say, “I’m the next one!” Congratulations, Bryce, on being the next one employed, the next one with Medical Billing and Coding Certifications and a Gold WorkKeys Certificate, and the next one to achieve your dreams!To find out more about career pathways and how the SC Works WorkLink WIOA program can help you achieve success, call Steve at 1-864-643-0071 (TTY 711).